I love to browse about DIY things but I never have the time (or the courage) to do most of them. Well, I once tried to acid-washed my jeans (and failed) and several days ago I tried to do another DIY which is "how to make shredded jeans" (but I didn't finished it because I didn't realize that it would took a long time and I got tired and bored ^o^). But nevertheless, I keep on browsing for some useful and interesting DIY things with a plan to try it on later. And I found some genius crafty ladies who has done amazing DIY projects which I silently envy, and here I'm gonna show you a couple of my favorite DIY things that I think should worth the try (although I don't know if I have the skills to make these, oh how I wish I could sew, I mean really sew....I could only do a simple hand-stitch to fix a hole in my clothing). First, you need two t-shirts and make these 3 circles from one of the tee. 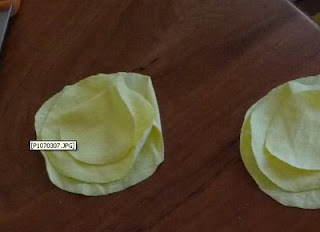 You can also sew the flower shape to other part of the shirts, be creative! Or, you can also sew them on to your skirts! This great DIY is courtesy of Jennifer Juniper of Hope Studios. Click here for this DIY tutorial! And then you add this wide grosgrain ribbon (or you could also use other fabrics such as suede or tulle!) by folding and then sewing it to both straps like in the picture below. This would be the base. 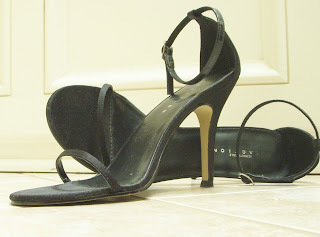 You have your Carrie Bradshaw shoes. This superb DIY is also a courtesy of Jennifer Juniper of Hope Studios. Isn't she a genius or what?! I love her ideas! Click here for this DIY tutorial! Now I know this kind of legging is probably "so last season" to some of you but I decided to post it anyway because I thought this DIY project is the easiest project I've ever seen. I saw this tutorial a long time ago but then I forgot all about it until now. I think I'm gonna make this since I love wearing leggings, it's comfy and with this shredded legging I could experience with different styles (punk/rock/gothic/artsy maybe??). Anyway, this DIY pic is courtesy of Caroline Robianto of Sour Cherry. She's Indonesian, like me. You could go here for more detailed instructions of this simple DIY project. thanks for sharing about the ideas.. I love to do some DIY too,,but mine was not great like them..hehe..
Fabulous DIY ideas, darling! I especially love the shoes! What a surprise! Thank you for linking my projects, I've gotten such good feedback from them :) Happy DIY'ing! Love the ideas and will have to ttry them, thanks! Thanks for sharing them in the first place. O wow I love your DIY tips I will definitely have to try some of these out on my own blog!